Holly Bargo is a pseudonym, but really did exist as a temperamental Appaloosa mare fondly remembered for her outsized personality. Holly and her husband live on a southwest Ohio hobby farm with a menagerie of four-legged beasties. They have two children, one graduating from university in 2019 and the other serving in the military. 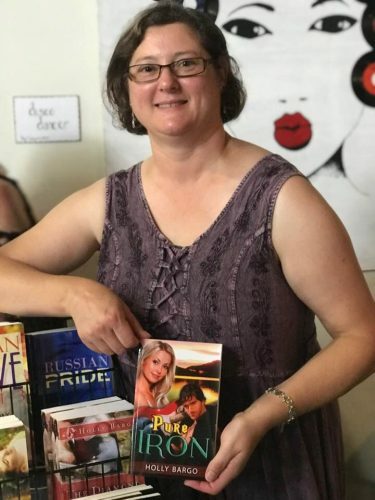 Holly works full-time as a freelance writer and editor and has published over 20 titles since 2014, mainly in the romance and fantasy genres–and often spanning them. If I don't write, my mind will explode. Seriously, though, I've always had stories in my head. It gets crowded in there. So, I write to exorcise them from my brain and make room for new stories. As a fiction writer, I'm undisciplined and seldom follow what the "experts" advise. I write by inspiration, because if I compel myself to write, then the content that results is garbage. Inspired writing, however, tends to be solid gold. Since I typically produce three or four books a year, I don't think productivity is a problem. I don't so much as talk to or listen to my characters as I eavesdrop upon their conversations and thoughts. They seldom address me directly. Edit. First self-edit to the absolute best of your ability. Do this at least twice. Then hire a professional editor. Competent editing doesn't come cheaply, but your readers will appreciate the improvement in quality. Decades ago I received encouragement, but no support in my writing. I won a contest, got encouraging feedback from some editors, but couldn't interest a publisher. Fast forward from the 1980s to 2014. I knew I had good stories and I knew myself to be a competent writer. The ebook revolution gathered momentum and I thought, "Why not?" I summoned my courage and decided to self-publish. I trembled with fear. I called a friend for moral support. Now it's 2019 and I still get twitchy every time I publish a book. But it's more excitement than dread, a real adrenaline rush. Traditional publishing will continue to serve as the industry standard for quality content–not because they're always right, but because they reliably use professional editors to refine content. Indie authors must overcome a justified reputation for producing poor quality content. Collectively, we do a poor job of upholding professional standards. Unless indie authors as a whole make a concerted effort to produce top quality content, readers will veer back to traditionally published books.